Collection of eleven different Russian Trilobites. 9 different species Asaphus, 1 Illaenus & 1 Pliomera. REALLY the BEST OFFER at WHOLE5SALE PRICE. 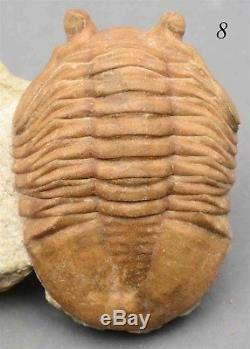 Size: trilobites size 80 x 43 mm; approx. Matrix size 90 x 80 x 35 mm, weight 293 gram. Age: Volkhov Horizon, Lower Ordovician (480 million year ago). Restoration is about 3 %. 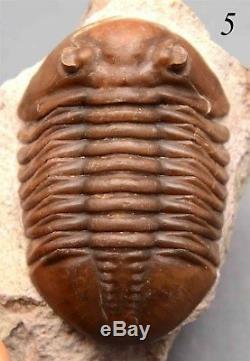 Size: trilobite size 90 x 52 mm; approx. Matrix size 120 x 110 x 40 mm, weight 593 gram. Age: Aseri Horizon, Middle Ordovician (465 million year ago). 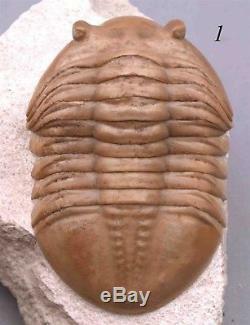 Size: trilobite size 80 x 45 mm; approx. Matrix size 110 x 80 x 25 mm; weight 267 gram. Age: Kunda Horizon, Lower Ordovician. Restoration is about 5 %. Size: trilobite size 95 x 48 mm; approx. Matrix size 120 x 70 x 35 mm, weight 315 gram. Restoration is about 1 %. Size trilobites size 70 x 43 mm; approx. Matrix size 110 x 60 x 35 mm, weight 220 gram. Age: Kunda Horizon, Lower Ordovician, zone Asaphus expansus. 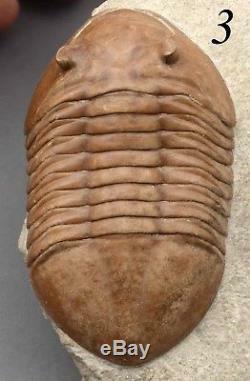 Size: trilobites size 65 x 42 mm; approx. Matrix size 90 x 70 x 30 mm, weight 165 gram. 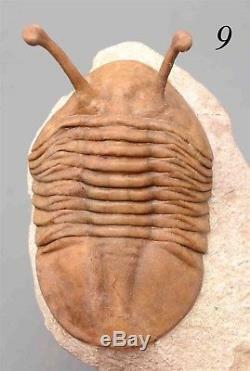 Age: zone Asaphus expansus, Kunda Horizon, Lower Ordovician (468 million year ago). Asaphus plautini polyxenus (Ivantsov, 2003). 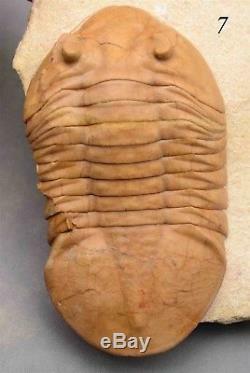 Size: trilobite size 89 x 48 mm; approx. Matrix size 110 x 80 x 25 mm, weight 254 gram. Age: Aseri Horizon, Middle Ordovician, zone Asaphus plautini (465 million year ago). Restoration of about 1 %. 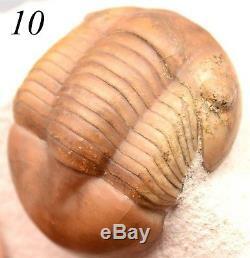 Size: trilobite size 79 x 46 mm; approx. Matrix size 80 x 70 x 25 mm, weight 156 gram. Age: Aseri Horizon, Middle Ordovician, zone Asaphus kowalewskii. 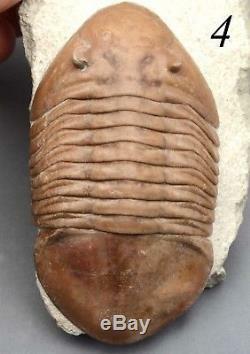 Size: trilobite size 72 x 45 mm; the length of the eyes is approx. Matrix size 110 x 70 x 30 mm, weight 195 gram. Age: Aseri Horizon, Middle Ordovician. 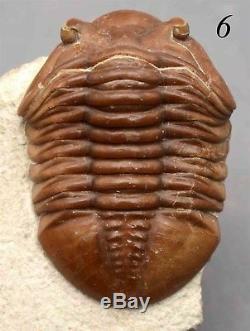 Size: trilobites size 55 x 31 mm; approx. Matrix size 75 x 75 x 40 mm, weight 181 gram. Age: Kunda Horizon, Lower Ordovician, zone Asaphus expansus (468 million year ago). 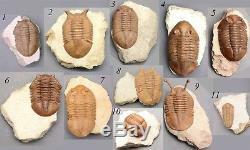 Size: trilobites size 45 x 20 mm; approx. Matrix size 70 x 60 x 25 mm, weight 114 gram. We ourselves dig and prepare from simple to the most rare ordovician trilobites of the St. Petersburg region about 24 years. Powered by SixBit's eCommerce Solution. The item "COLLECTION of 11 DIFFERENT Trilobites Russian WHOLESALE BEST OFFER" is in sale since Friday, May 11, 2018. 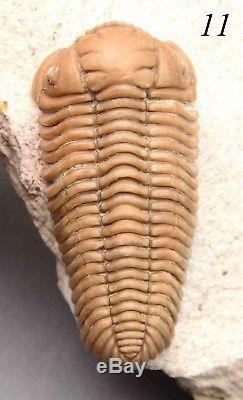 This item is in the category "Collectibles\Rocks, Fossils & Minerals\Fossils\Arthropods\Trilobites". 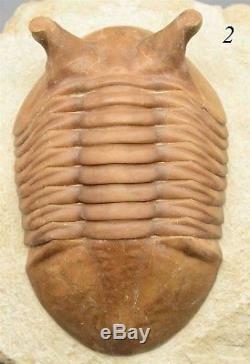 The seller is "russiantrilobites" and is located in 53000. This item can be shipped to North, South, or Latin America, all countries in Europe, all countries in continental Asia, Australia.